Not to be confused with Chiang Rai (city) or Chengmai County. This article is about the city Chiang Mai. For other uses, see Chiang Mai (disambiguation). Chiang Mai (/ˌtʃæŋ ˈmaɪ/, from Thai: เชียงใหม่ [tɕʰīəŋ màj] ( listen), Northern Thai: ᨩ᩠ᨿᨦ ᩲᩉ᩠ᨾ᩵ [t͡ɕīəŋ.màj] ( listen)) sometimes written as "Chiengmai" or "Chiangmai" is the largest city in northern Thailand. It is the capital of Chiang Mai Province and was a former capital of the kingdom of Lan Na (1296–1768), which later became the Kingdom of Chiang Mai, a tributary state of Siam from 1774 to 1899, and finally the seat of princely rulers until 1939. It is 700 km (435 mi) north of Bangkok near the highest mountains in the country. The city sits astride the Ping River, a major tributary of the Chao Phraya River. Chiang Mai means "New City" and was so named because it became the new capital of Lan Na when it was founded in 1296, succeeding Chiang Rai, the former capital founded in 1262.:208–209 Its ceremonial full name is Nopburi Si-Nakhonping Chiangmai (นพบุรีศรีนครพิงค์เชียงใหม่) which means Chiangmai, Ping's City of the Nine referring the ancient nine Lannese tribes in this area. In May 2006 Chiang Mai was the site of the Chiang Mai Initiative, concluded between the Association of Southeast Asian Nations and the "ASEAN+3" countries, (China, Japan, and South Korea). Chiang Mai was one of three Thai cities contending for Thailand's bid to host the World Expo 2020. Ayutthaya was ultimately chosen by the Thai Parliament to register for the international competition. In early December 2017, Chiang Mai was awarded the UNESCO title of Creative City. In 2015, Chiang Mai was on the tentative list for UNESCO World Heritage inscription. Chiang Mai was one of two tourist destinations in Thailand on TripAdvisor's 2014 list of "25 Best Destinations in the World", where it stands at number 24. While officially the city (thesaban nakhon, "city municipality") of Chiang Mai only covers most parts of the Mueang Chiang Mai District, with a population of 160,000, the city's sprawl extends into several neighboring districts. The Chiang Mai metropolitan area has a population of nearly one million people, more than half the total of Chiang Mai Province. The city is subdivided into four khwaeng (electoral wards): Nakhon Ping, Srivijaya, Mengrai, and Kawila. The first three are on the west bank of the Ping River, and Kawila is on the east bank. 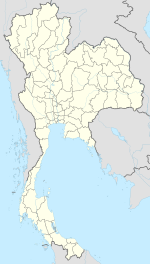 Nakhon Ping District includes the northern part of the city. Srivijaya, Mengrai, and Kawila consist of the western, southern, and eastern parts, respectively. The city center—within the city walls—is mostly within Srivijaya ward. The Ping River, one of the main tributaries of the Chao Phraya River, originates at Doi Thuai, in the mountains of the Daen Lao Range in Chiang Dao District. The river, the largest in the region, runs from north to south, forming a river basin east of Chiang Mai. Mae Ping River also served as the route of trade and communication between Chiang Mai and its controlled states in Lanna, as well as the outside world. 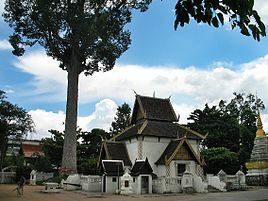 Mangrai founded Chiang Mai in 1294 or 1296:209 on the site of an older city of the Lawa people called Wiang Nopburi. Gordon Young, in his 1962 book The Hill tribes of Northern Thailand, mentions how a Wa chieftain in British Burma told him that the Wa, a people who are closely related to the Lawa, once lived in the Chiang Mai valley in "sizeable cities". Chiang Mai succeeded Chiang Rai as the capital of Lan Na. Pha Yu enlarged and fortified the city, and built Wat Phra Singh in honor of his father Kham Fu. :226–227 The ruler was known as the chao. 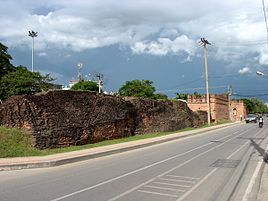 The city was surrounded by a moat and a defensive wall since nearby Taungoo Dynasty of the Bamar people was a constant threat, as were the armies of the Mongol Empire, which only decades earlier had conquered most of Yunnan, China, and in 1292 overran the bordering Dai kingdom of Chiang Hung. With the decline of Lan Na, the city lost importance and was occupied by the Taungoo in 1556. Chiang Mai formally became part of the Thonburi Kingdom in 1775 by an agreement with Chao Kavila, after the Thonburi king Taksin helped drive out the Taungoo Bamar. Because of Taungoo counterattacks, Chiang Mai was abandoned between 1776 and 1791. Lampang then served as the capital of what remained of Lan Na. Chiang Mai then slowly grew in cultural, trading, and economic importance to its current status as the unofficial capital of Northern Thailand, second in importance only to Bangkok. The modern municipality dates to a sanitary district (sukhaphiban) that was created in 1915. It was upgraded to a municipality (thesaban) on 29 March 1935, as published in the Royal Gazette, Book No. 52 section 80. First covering just 17.5 km2 (7 sq mi), the city was enlarged to 40.2 km2 (16 sq mi) on 5 April 1983. The city emblem shows the stupa at Wat Phra That Doi Suthep in its center. Below it are clouds representing the moderate climate in the mountains of northern Thailand. There is a nāga, the mythical snake said to be the source of the Ping River, and rice stalks, which refer to the fertility of the land. Chiang Mai has a tropical savanna climate (Köppen Aw), tempered by the low latitude and moderate elevation, with warm to hot weather year-round, though nighttime conditions during the dry season can be cool and much lower than daytime highs. The maximum temperature ever recorded was 42.4 °C (108.3 °F) in May 2005. Cold and hot weather effects occur immediately but cold effects last longer than hot effects and contribute to higher cold related motility risk among old people aged more than 85 years. A continuing environmental issue in Chiang Mai is the incidence of air pollution that primarily occurs every year towards the end of the dry season between February and April. In 1996, speaking at the Fourth International Network for Environmental Compliance and Enforcement conference—held in Chiang Mai that year—the Governor Virachai Naewboonien invited guest speaker Dr. Jakapan Wongburanawatt, Dean of the Social Science Faculty of Chiang Mai University, to discuss air pollution efforts in the region. Dr. Wongburanawatt stated that, in 1994, an increasing number of city residents attended hospitals suffering from respiratory problems associated with the city's air pollution. During the February–March period, air quality in Chiang Mai often remains below recommended standards, with fine-particle dust levels reaching twice the standard limits. According to the Bangkok Post, corporations in the agricultural sector, not farmers, are the biggest contributors to smoke pollution. The main source of the fires is forested area being cleared to make room for new crops. The new crops to be planted after the smoke clears are not rice and vegetables to feed locals. A single crop is responsible: corn. "The true source of the haze...sits in the boardrooms of corporations eager to expand production and profits. A chart of Thailand's growth in world corn markets can be overlaid on a chart of the number of fires. It is no longer acceptable to scapegoat hill tribes and slash-and-burn agriculture for the severe health and economic damage caused by this annual pollution." These data have been ignored by the government. The end is not in sight, as the number of fires has increased every year for a decade, and data shows more pollution in late-February 2016 than in late-February 2015. The northern centre of the Meteorological Department has reported that low-pressure areas from China trap forest fire smoke in the mountains along the Thai-Myanmar border. Research conducted between 2005 and 2009 showed that average PM10 rates in Chiang Mai during February and March were considerably above the country's safety level of 120 μg/m3, peaking at 383 μg/m3 on 14 March 2007. PM2.5 rates (fine particles 75% smaller than PM10) reached 183 μg/m3 in Chiang Mai in 2018. According to the World Health Organization (WHO), the acceptable level of PM10 is 50 μg/m3 and PM2.5 is 25 μg/m3. To address the increasing amount of greenhouse gas emissions from the transport sector in Chiang Mai, the city government has advocated the use of non-motorised transport (NMT). In addition to its potential to reduce greenhouse gas emissions, the NMT initiative addresses other issues such as traffic congestion, air quality, income generation for the poor, and the long-term viability of the tourism industry. It has been said that smoke pollution has made March "the worst month to visit Chiang Mai". Wat Phra That Doi Suthep, the city's most famous temple, stands on Doi Suthep, a mountain to the north-west of the city. The temple dates from 1383. Wat Chiang Man, the oldest temple in Chiang Mai, dating from the 13th century. :209 King Mengrai lived here during the construction of the city. This temple houses two important and venerated Buddha figures, the marble Phra Sila and the crystal Phra Satang Man. Wat Phra Singh is within the city walls, dates from 1345, and offers an example of classic Northern Thai-style architecture. It houses the Phra Singh Buddha, a highly venerated figure brought here many years ago from Chiang Rai. Wat Chedi Luang was founded in 1401 and is dominated by a large Lanna style chedi, which took many years to finish. An earthquake damaged the chedi in the 16th century and only two-thirds of it remains. Wat Ku Tao in the city's Chang Phuak District dates from (at least) the 13th century and is distinguished by an unusual alms-bowl-shaped stupa thought to contain the ashes of King Anawrahta, Chiang Mai's first Bamar ruler. Wat Chet Yot is on the outskirts of the city. Built in 1455, the temple hosted the Eighth World Buddhist Council in 1977. Wiang Kum Kam is at the site of an old city on the southern outskirts of Chiang Mai. King Mangrai lived there for ten years before the founding of Chiang Mai. The site includes many ruined temples. Wat Umong is a forest and cave wat in the foothills west of the city, near Chiang Mai University. Wat U-Mong is known for its "fasting Buddha", representing the Buddha at the end of his long and fruitless fast prior to gaining enlightenment. Wat RamPoeng (Tapotaram), near Wat U-Mong, is known for its meditation center (Northern Insight Meditation Center). The temple teaches the traditional vipassanā technique and students stay from 10 days to more than a month as they try to meditate at least 10 hours a day. Wat RamPoeng houses the largest collection of Tipitaka, the complete Theravada canon, in several Northern dialects. Wat Suan Dok is a 14th-century temple just west of the old city wall. It was built by the king for a revered monk visiting from Sukhothai for a rainy season retreat. The temple is also the site of Mahachulalongkorn Rajavidyalaya Buddhist University, where monks pursue their studies. "First Church" was founded in 1868 by the Laos Mission of the Rev. Daniel and Mrs. Sophia McGilvary. Chiang Mai has about 20 Christian churches Chiang Mai is the seat of the Roman Catholic Diocese of Chiang Mai at Sacred Heart Cathedral. Muslim traders have traveled to north Thailand for many centuries, and a small settled presence has existed in Chiang Mai from at least the middle of the 19th century. The city has mosques identified with Chinese or Chin Haw Muslims as well as Muslims of Bengali, Pathan, and Malay descent. In 2011, there were 16 mosques in the city. Two gurdwaras (Sikh places of worship), Siri Guru Singh Sabha and Namdhari, serve the city's Sikh community. The Hindu temple Devi Mandir serves the Hindu community. The Administration of Chiang Mai Municipality is responsible for an area that covers approximately 40.216 square kilometers and consists of 4 Municipal Districts, 14 sub-districts, 89 municipal communities, and approximately 70,000 households. According to Municipal Act B.E. 2496 (1953, reviewed in 2003), the duties of the Municipality cover a lot of areas which include clean water supply, waste and sewage disposal, communicable disease control, public training and education, public hospitals and electricity, etc. The mayor, or the highest executive, is directly elected by the eligible voters in the municipal area. The mayor serves a four-year term and is assisted by no more than four deputy mayors appointed directly by the mayor. The mayor will thus be permitted to appoint deputies, secretaries and advisors including the mayor himself or herself totally no more than 10. The current Mayor is Tussanai Burabupakorn, as of June 2018. The Municipal Council is the legislative body of the municipality. It has the power to issue ordinances by laws that do not contradict with the laws of the country. The municipal council applies to all people living in the municipal area. The Chiang Mai City Municipal Council is composed of 24 elected members from 4 municipal districts who each serves a 4-year term. Loi Krathong (known locally as Yi Peng), held on the full moon of the 12th month of the traditional Thai lunar calendar, being the full moon of the second month of the old Lanna calendar. In the Western calendar this usually falls in November. Every year thousands of people assemble floating banana-leaf containers (krathong) decorated with flowers and candles and deposit them on the waterways of the city in worship of the Goddess of Water. Lanna-style sky lanterns (khom fai or kom loi), which are hot-air balloons made of paper, are launched into the air. These sky lanterns are believed to help rid the locals of troubles and are also used to decorate houses and streets. Songkran is held in mid-April to celebrate the traditional Thai New Year. Chiang Mai has become one of the most popular locations to visit during this festival. A variety of religious and fun-related activities (notably the indiscriminate citywide water fight) take place each year, along with parades and Miss Songkran beauty competition. Chiang Mai Flower Festival is a three-day festival held during the first weekend in February each year; this event occurs when Chiang Mai's temperate and tropical flowers are in full bloom. Tam Bun Khan Dok, the Inthakhin (City Pillar) Festival, starts on the day of the waning moon of the sixth lunar month and lasts 6–8 days. The inhabitants speak Northern Thai, also known as Lanna or Kham Mueang. The script used to write this language, called the Tai Tham alphabet, is studied only by scholars, and the language is commonly written with the standard Thai alphabet. English, Chinese, and Japanese are used in hotels and travel-related businesses. Chiang Mai City Arts and Cultural Center. Chiang Mai National Museum highlights the history of the region and the Kingdom of Lan Na. Tribal Museum showcases the history of the local mountain tribes. Mint Bureau of Chiang Mai or Sala Thanarak, Treasury Department, Ministry of Finance, Rajdamnern Road (one block from AUA Language Center) has an old coin museum open to the public during business hours. The Lan Na Kingdom used leaf (or line) money made of brass and silver bubbles, also called "pig-mouth" money. Nobody has been able to duplicate the technique of making pig-mouth money, and because the silver is very thin and breakable, good pieces are now very rare. Khan tok is a century-old Lan Na Thai tradition in Chiang Mai. It is an elaborate dinner or lunch offered by a host to guests at various ceremonies or parties, such as weddings, housewarmings, celebrations, novice ordinations, or funerals. It can also be held in connection with celebrations for specific buildings in a Thai temple and during Buddhist festivals such as Khao Pansa, Og Pansa, Loi Krathong, and Thai New Year (Songkran). Khao Soi is a Northern Thai noodle curry dish found mostly in Chiang Mai. Khao Soi is usually presented in a simple bowl, with fresh lime wedge, shallots, and pickled cabbage. Chiang Mai has several universities, including Chiang Mai University, Chiang Mai Rajabhat University, Rajamangala University of Technology Lanna, Payap University, Far Eastern University, and Maejo University, as well as numerous technical and teacher colleges. Chiang Mai University was the first government university established outside of Bangkok. Payap University was the first private institution in Thailand to be granted university status. École française d'Extrême-Orient (EFEO), an institute for Asian studies, has a centre in Chiang Mai. Doi Pui–Doi Suthep National Park begins on the western edge of the city. Wat Doi Suthep Buddhist temple, located near the summit of Doi Suthep, can be seen from much of the city and its environs. Pha Daeng National Park, or more commonly Chiang Dao National Park, which includes Doi Chiang Dao and Pha Deang mountain near the border with Myanmar. Hill tribe tourism and trekking: Many tour companies offer organized treks among the local hills and forests on foot and on elephant back. Most also involve visits to various local hill tribes, including the Akha, Hmong, Karen, and Lisu. Chiang Mai Zoo, the oldest zoo in northern Thailand. Shopping: Chiang Mai has a large and famous night bazaar for local arts and handicrafts. The night markets extend across several city blocks along footpaths, inside buildings and temple grounds, and in open squares. A handicraft and food market opens every Sunday afternoon until late at night on Rachadamnoen Road, the main street in the historical centre, which is then closed to motorised traffic. Every Saturday evening a handicraft market is held along Wua Lai Road, Chiang Mai's silver street on the south side of the city beyond Chiang Mai Gate, which is then also closed to motorised traffic. Thai massage: The back streets and main thoroughfares of Chiang Mai have many massage parlours which offer anything from quick, simple, face and foot massages, to month-long courses in the art of Thai massage. Thai cookery: A number of Thai cooking schools have their home in Chiang Mai. For IT shopping, Pantip Plaza just south of Night Bazaar, as well as Computer Plaza, Computer City, and Icon Square near the northwestern moat corner, and IT City department store in Kad Suan Kaew Mall are available. Horse racing: Every Saturday starting at 12:30 there are races at Kawila Race Track. Betting is legal. A number of bus stations link the city to central, southeast, and northern Thailand. The central Chang Puak Terminal (north of Chiang Puak Gate) provides local services within Chiang Mai Province. The Chiang Mai Arcade bus terminal northeast of the city centre (which can be reached with a songthaew or tuk-tuk ride) provides services to over 20 other destinations in Thailand including Bangkok, Pattaya, Hua Hin, and Phuket. There are several services a day from Chiang Mai Arcade terminal to Mo Chit Station in Bangkok (a 10- to 12-hour journey). The state railway operates 10 trains a day to Chiang Mai Station from Bangkok. Most journeys run overnight and take approximately 12–15 hours. Most trains offer first-class (private cabins) and second-class (seats fold out to make sleeping berths) service. Chiang Mai is the northern terminus of the Thai railway system. Chiang Mai International Airport receives up to 28 flights a day from Bangkok (flight time about 1 hour 10 minutes) and also serves as a local hub for services to other northern cities such as Chiang Rai, Phrae, and Mae Hong Son. International services also connect Chiang Mai with other regional centers, including cities in other Asian countries. The locally preferred form of transport is personal motorbike and, increasingly, private car. Local public transport is via tuk-tuk, songthaew, bus, or rickshaw. New electric tuks-tuks were introduced into the city in June 2017. As population density continues to grow, greater pressure is placed upon the city's transportation system. During peak hours, the road traffic is often badly congested. The city officials as well as researchers and experts have been trying to find feasible solutions to tackle the city's traffic problems. Most of them agree that factors such as lack of public transport, increasing number of motor vehicles, inefficient land use plan and urban sprawl, have led to these problems. The latest development is that Mass Rapid Transit Authority of Thailand (MRTA) has approved a draft decree on the light railway transit system project in Chiang Mai. If the draft is approved by the Thai cabinet, the construction could begin in 2020 and be completed by 2023. It is believed that such a system would mitigate Chiang Mai's traffic problems to a large degree. In February 2017, the Digital Economy Promotion Agency (DEPA) (under Thailand's Digital Economy and Society Ministry) announced that 36.5 million baht would be invested into developing Chiang Mai into an innovation-driven "smart city". Chiang Mai was the second city in Thailand, after Phuket and along with Khon Kaen, to be developed using the "smart city" model. The model aims to capture and populate multiple levels of information (including building, social, environmental, governmental, and economic data) from sources like sensors, real-time traffic information, and social forums for access by managers, governments, and citizens using mobile apps, tablets, and dashboards. The "Smart City" outlook (integrating Information and Communications Technology (ICT) with the Internet of Things (IOT)), is viewed to be critical both for secondary cities with burgeoning urban population like Chiang Mai, as well as part of Thailand's move to be digital hub of ASEAN. The role of private sector investment, together with public sector partnership, is key to promote digital entrepreneurship. Prosoft Comtech, a Thai software company, has spent 300 million baht to build its own "Oon IT Valley" on a 90 rai plot of land as a community for tech start-ups, Internet of Things technology, software programmers and business process outsourcing services. It is aimed to both increase the size of Chiang Mai's digital workforce, as well as attract foreign digital talent to Chiang Mai. In January 2018, it was announced that Chiang Mai would be launching "Mobike In", a bike-sharing app that would see the introduction of some 500 smart bikes on the streets. The smart bikes would be available for use for both locals and tourists. It is reported that as a start, the bikes would be placed at convenient locations including the Three Kings monument, Tha Pae Gate and Suan Buak Haad Park, as well as in the old town. The "Mobike In" project is sponsored by Advanced Info Service (Thailand's largest mobile phone operator), in collaboration with the Tourism Authority of Thailand (Chiang Mai Office), together with local universities, public and private sectors. The project aims to promote non-motorised transportation and support eco-tourism. Speaking at the launch at the Lanna Folklife Museum, Deputy Governor Puttipong Sirimart stated that the introduction of such "smart transportation" was a positive move in Chiang Mai's transformation into a "Smart City" (part of the "Thailand 4.0" vision). Phongsak Ariyajitphaisal, DEPA's Chiang Mai branch manager, stated that one of the areas its smart city initiative would be promoting was "smart agriculture". Eighty percent of Chiang Mai Province's population are farmers, mostly small-scale, and increasing productivity through use of ICT has the potential to improve the local economy and living standards. DEPA has also provided funding to Chiang Mai's Maejo University, to develop wireless sensor systems for better farmland irrigation techniques, to reduce use of water sprinklers and increase productivity. The university is also developing agricultural drones that can spray fertilizers and pesticides on crops which, if successful, will result in lower costs. The drones may also detect and monitor fires and smoke pollution. Under the 2011 IBM "Smarter Cities Challenge", IBM experts recommended smarter food initiatives focused on creating agricultural data for farmers, including price modelling, farmer-focused weather forecasting tools, an e-portal to help farmers align crop production with demand, as well as branding of Chiang Mai produce. Longer-term recommendations included implementing traceability, enabling the tracking of produce from farm to consumer, smarter irrigation as well as flood control and early warning systems. As part of the smart city project supported by IBM, Chiang Mai is also looking to use technology to boost its presence as a medical tourism hub. In 2011, IBM launched its Smarter Cities Challenge, a three-year, 100 city, 1.6 billion baht (US$50 million) program where teams of experts study and make detailed recommendations to address local important urban issues. 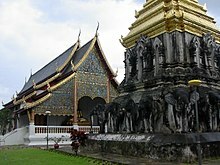 Chiang Mai won a grant of about US$400,000 in 2011. The IBM team focused on smarter healthcare initiatives, aimed at making Chiang Mai and the University Medical Clinic a medical hub, as well as improving efficiency of hospitals for improved service delivery. For example, healthcare providers could use real-time location tracking of patients and hospital assets to increase efficiency and build an internationally recognised service identity. Electronic medical record technology can also be adopted to standardise information exchanges to link all medical service providers, even including traditional medicine and spas. Similar ideas include linking patient databases and healthcare asset information. In partnership with the Faculty of Medicine at Chiang Mai University, the team of experts aim to enhance the quality of medical care available to the community, both urban and rural, as well as develop Chiang Mai into a centre for medical tourism with the infrastructure for supporting international visitors seeking long-term medical care. As the largest city in northern Thailand, Chiang Mai already receives some long stay healthcare visitors, largely Japanese. Its main advantage over Bangkok is lower costs of living. Quality services at low prices are a major selling point in mainstream healthcare, dental and ophthalmologic care as well as Thai traditional medicine. Its local university is also developing specializations in robotic surgery and geriatric medicine to accommodate a future aging population. DEPA also reported that it has developed a mobile app that uses augmented reality technology to showcase various historical attractions in Chiang Mai, in line with the government's policy to promote Chiang Mai as a world heritage city. According to Thailand's Tourist Authority, in 2013 Chiang Mai had 14.1 million visitors: 4.6 million foreigners and 9.5 million Thais. In 2016, tourist arrivals were expected to grow by approximately 10 percent to 9.1 million, with Chinese tourists increasing by seven percent to 750,000 and international arrivals by 10 percent to 2.6 million. Tourism in Chiang Mai has been growing annually by 15 percent per year since 2011, mostly due to Chinese tourists who account for 30 percent of international arrivals. In 2015, 7.4 million tourists visited Chiang Mai. Out of these, 35 percent were foreign tourists. The number of tourists has increased with an average rate of 13.6 percent annually between 2009 and 2015. The major reasons that have made Chiang Mai a tourist attraction are its topography, climate, and cultural history. Chiang Mai is estimated to have 32,000–40,000 hotel rooms and Chiang Mai International Airport (CNX) is Thailand's fourth largest airport, after Suvarnabhumi (BKK), Don Mueang (DMK), and Phuket (HKT). Planning is underway for a second airport with a capacity to serve 10 million annual passengers. The influx of tourists has put a strain on the city's natural resources. Faced with rampant unplanned development, air and water pollution, waste management problems, and traffic congestion, the city has launched a non-motorised transport (NMT) system. The initiative, developed by a partnership of experts and with support from the Climate & Development Knowledge Network, aims to reduce greenhouse gas emissions and create employment opportunities for the urban poor. The climate compatible development strategy has gained support from policy-makers and citizens alike as a result of its many benefits. 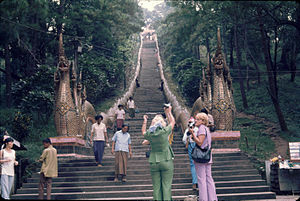 Tourism has also brought benefits for the local community of Chiang Mai. For example, tourism has played a tremendous role in promoting arts and crafts market in Chiang Mai. Tourists have increased demand for traditional crafts and art forms that has resulted in the incentives for the local artists to enhance their work thus adding to the prosperity of the sector. Moreover, there are great opportunities for agritourism in Chiang Mai.The factor analysis illustrates three types of agri needs, activities and shopping, facilities, services and location and the last one attractions and environment. Agritoursim is a type of business that a farmer conducts for additional farm income. Farmers, through the promotions of agricultural products, provide enjoyment and educate public about farming and agriculture. Rodjaraeg Wattanapanit – the first Thai winner of the International Women of Courage Award. ^ a b c d Cœdès, George (1968). Walter F. Vella (ed.). The Indianized States of south-east Asia. trans.Susan Brown Cowing. University of Hawaii Press. ISBN 978-0-8248-0368-1. ^ S.T. Leng (October–November 2010). "TCEB keen on World Expo 2020". Exhibition Now. Archived from the original on July 4, 2011. Retrieved 13 Jan 2013. ^ Suchat Sritama (2011-04-05). "Ayutthaya Chosen Thailand's Bid City for World Expo 2020". The Nation (Thailand) Asia News Network. Archived from the original on 2011-08-09. Retrieved 12 Dec 2012. ^ "Chiang Mai Night Bazaar in Chiang Mai Province, Thailand". Lonely Planet. 2011-10-24. Retrieved 2012-07-05. ^ "มหาวิทยาลัยนอร์ท-เชียงใหม่ [North – Chiang Mai University]". Northcm.ac.th. Archived from the original on April 24, 2012. Retrieved 2012-07-05. ^ "Chiang Mai Municipality" (in Thai). Chiang Mai City. 2008. Archived from the original on September 15, 2008. Retrieved 2008-10-04. ^ Centre, UNESCO World Heritage. "Monuments, Sites and Cultural Landscape of Chiang Mai, Capital of Lanna - UNESCO World Heritage Centre". whc.unesco.org. Retrieved 2017-10-09. ^ Colquhoun, Archibald Ross (1885). Amongst the Shans. New York: Scribner & Welford. p. 121. Retrieved 8 February 2018. ^ Aroonrut Wichienkeeo (2001–2012). "Lawa (Lua) : A Study from Palm-Leaf Manuscripts and Stone Inscriptions". COE Center of Excellence. Rajabhat Institute of Chiangmai. Archived from the original on 7 July 2012. Retrieved 15 Aug 2012. ^ "History of Chiang Mai – Lonely Planet Travel Information". Lonelyplanet.com. 2006-09-19. Retrieved 2012-07-05. ^ "Thailand's World: General Kavila". Thailandsworld.com. 2012-05-06. Archived from the original on 2012-06-15. Retrieved 2012-07-05. ^ Jimmy Carter; Rosalynn Carter (2009). "Thailand Transformation". Habitat for Humanity International. Archived from the original on September 13, 2010. Retrieved 15 Aug 2012. 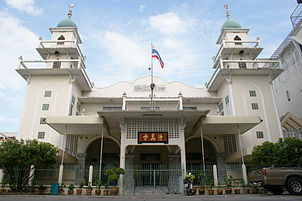 ^ "Chiang Mai Municipality — History". Chiang Mai City. 2008. Archived from the original on 28 June 2008. Retrieved 2008-10-04. ^ "Chiang Mai Municipality — Emblem". Chiang Mai City. 2008. Archived from the original on June 30, 2008. Retrieved 2008-10-04. ^ "Daily Climate Weather Data Statistics". Geodata.us. Retrieved 2012-04-29. ^ "Climatological Data for the Period 1981–2010". Thai Meteorological Department. p. 2. Retrieved 31 July 2016. ^ "ปริมาณการใช้น้ำของพืชอ้างอิงโดยวิธีของ Penman Monteith (Reference Crop Evapotranspiration by Penman Monteith)" (PDF) (in Thai). Office of Water Management and Hydrology, Royal Irrigation Department. p. 14. Retrieved 31 July 2016. ^ "Air Pollution in Chiang Mai: Current Air Quality & PM-10 Levels". Earthoria. 2008-02-27. Retrieved 2010-04-15. ^ "Officials in a haze". Bangkok Post. 2016-02-23. Retrieved 23 February 2016. ^ "Chiang Mai's air pollution still high". Nationmultimedia.com. 2007-03-11. Archived from the original on 2011-05-01. Retrieved 2010-04-15. ^ "Chiang Mai CityNews - Chiang Mai Records Highest PM2.5 Readings in the World, March 6, 2018". www.chiangmaicitylife.com. Retrieved 2018-04-16. ^ "WHO Air quality guidelines for particulate matter, ozone, nitrogen dioxide and sulfur dioxide, Global Update 2005" (PDF). WHO. 2006. Retrieved 2012-03-21. ^ a b Kusakabe, Kyoko; Shrestha, Pujan; Kumar, S; Suwanprik, Trinnawat (May 2014). "Catalysing sustainable tourism: The case of Chiang Mai, Thailand" (PDF). Climate & Development Climate Network (CDKN). Retrieved 21 June 2018. ^ "Wat Ku Tao: Chang Phuak's Watermelon Temple", in Forbes, Andrew, and Henley, David, Ancient Chiang Mai, Volume 1. Chiang Mai, Cognoscenti Books, 2012. ^ "Wat Rampoeng Tapotharam" in Forbes, Andrew, and Henley, David, Ancient Chiang Mai, Volume 3. Chiang Mai, Cognoscenti Books, 2012. ^ "Churches". Chiang Mai Info. Retrieved 2010-04-15. ^ a b c "Chiang Mai — A Complete Guide To Chiangmai". Chiangmai-thai.com. 2008-07-06. Retrieved 2010-04-15. ^ a b c d "Chiang Mai Municipality". ^ See: Forbes, Andrew, "The Peoples of Chiang Mai", in Penth, Hans, and Forbes, Andrew, A Brief History of Lan Na. Chiang Mai City Arts and Cultural Centre, Chiang Mai, 2004, pp. 221–256. ^ "Thai Coins History". Royal Thai Mint. 28 Mar 2010. Archived from the original on April 2, 2012. Retrieved 19 Sep 2011. ^ "Khan Tok Dinner". Lanna Food. Chiang Mai University Library. Retrieved 2014-10-29. ^ "The Chiang Mai Centre, Thailand." École française d'Extrême-Orient. Retrieved on 8 September 2018. ^ "Chiang Mai's Hill Peoples", in Forbes, Andrew, and Henley, David, Ancient Chiang Mai, Volume 3. Chiang Mai, Cognoscenti Books, 2012. ^ Lonely Planet (2012). "Shopping in Chiang Mai". Lonely Planet. Lonely Planet. Retrieved 15 August 2012. ^ "เชียงใหม่เปิดตัวและแสดงข้อมูลระบบขนส่งสาธารณะ จับทุกภาคส่วนลงนามร่วมพัฒนาต่อเนื่อง". Manager Online (in Thai). Retrieved 2018-03-03. ^ "Chiang Mai CityNews - 450 Electric Tuk Tuks for Chiang mai Approved by DLT". www.chiangmaicitylife.com. Retrieved 2018-07-04. ^ Peraphan, Jittrapirom; Hermann, Knoflacher; Markus, Mailer (2017-01-01). "Understanding decision makers' perceptions of Chiang Mai city's transport problems an application of Causal Loop Diagram (CLD) methodology". Transportation Research Procedia. World Conference on Transport Research - WCTR 2016 Shanghai. 10–15 July 2016. 25 (Supplement C): 4438–4453. doi:10.1016/j.trpro.2017.05.350. ^ "Green Light for Chiang Mai Light Railway Transit System". Chiang Mai Citylife. Retrieved 2017-10-08. ^ "Chiang Mai for Digital Nomads". Moving Nomads. Retrieved 2018-02-06. ^ Boonnoon, Jirapan (2017-01-27). "DE Ministry pushing for nationwide". The Nation. Retrieved 2018-03-01. ^ "Prayut gets long-distance look at 'smart' 3D Chiang Mai". The Nation. 22 September 2017. Retrieved 2018-03-01. ^ Da Hsuan, Feng; Hai Ming, Liang (28 September 2017). "Thailand can be smart-city flagship for Belt and Road" (Editorial). The Nation. Retrieved 2018-03-01. ^ Asina Pornwasin (15 September 2015). "Plan to make Phuket and Chiang Mai 'smart cities'". The Nation. Retrieved 2018-03-01. ^ "Oon IT Valley ออนไอทีวัลเลย์ เมืองไอที วิถีล้านนา". Oon IT Valley ออนไอทีวัลเลย์ เมืองไอที วิถีล้านนา (in Thai). Retrieved 2018-03-01. ^ a b c Leesa-Nguansuk, Suchit (11 February 2017). "Chiang Mai to become smart city". Bangkok Post. Retrieved 2018-03-01. ^ "Chiang Mai To Get 500 Smart Bikes, Known as MOBIKE IN". Citylife Chiang Mai. 2018-01-19. Retrieved 2018-03-01. ^ "Chiang Mai Summary Report" (PDF). IBM Smarter Cities Challenge. 2011. Retrieved 2018-03-01. ^ Sambandaraksa, Don (22 September 2010). "IBM focuses on Chiang Mai". Bangkok Post. Retrieved 2018-03-01. ^ a b "Smarter technology: medical tourism in Thailand". International Medical Travel Journal (IMTJ). 2 June 2011. Retrieved 2018-03-01. ^ Leesa-Nguansuk, Suchit (1 August 2016). "A tale of smart cities". Bangkok Post. Retrieved 2018-03-01. ^ Boonnoon, Jirapan (19 July 2012). "Thai arm of IBM spreads wings in Laos". The Nation. Retrieved 2018-03-01. ^ a b "Internal Tourism in Chiang Mai" (PDF). Thailand Department of Tourism. Department of Tourism. 2014-08-20. Archived from the original (PDF) on 2014-10-29. Retrieved 2014-10-29. ^ a b c Chinmaneevong, Chadamas (2016-05-21). "Chiang Mai hoteliers face price war woe". Bangkok Post. Retrieved 22 May 2016. ^ "2013 (Statistic Report 2013)". About AOT: Air Transport Statistic. Airports of Thailand PLC. Archived from the original on 2014-12-07. Retrieved 2014-12-09. ^ "» Second airports slated for Phuket and Chiang Mai". thaiembdc.org. Retrieved 2018-12-12. ^ Amnatcharoenrit, Bamrung. "Chiang Mai sees boost in MICE sector" (2013-09–27). The Nation. Retrieved 2014-12-09. ^ Michael Romanos & Christopher Auffrey (May 15, 2002). Managing Intermediate Size Cities: Sustainable Development in a Growth Region of Thailand. Springer Science+Business Media Dordrecht The GeoJournal Library Volume 69, 2002, Pages 127-151. ^ Natthawut Srikatanyoo &Kom Campiranon (11 March 2010). "Agritourist Needs and Motivations: The Chiang Mai Case". Journal of Travel & Tourism Marketing, 27:2, 166-178, DOI: 10.1080/10548400903579795. ^ Ashayagachat, Achara (30 March 2016). "Chiang Mai activist wins US 'courage award'". Bangkok Post. Retrieved 21 June 2018. Wikimedia Commons has media related to Chiang Mai. Wikivoyage has a travel guide for Chiang Mai. "Chieng Mai" . Encyclopædia Britannica. 6 (11th ed.). 1911. p. 132.